State and local employees do not always receive the same worker safety guarantees as those in the private sector. Why is this, and what can be done to ensure the safety of public employees. Only 25 states are State Plan states that require public employers to follow OSHA standards. 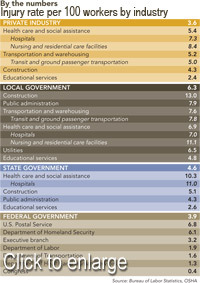 Budget concerns and diversity challenges can make it more difficult to ensure the safety and health of public workers. Several options are available to ensure the safety of public workers, including regulations, consultations and trainings. They clean our water and pick up our trash. They arrest burglars and drive us to work. They teach our children and put out house fires. Despite all they do, many workers employed by local or state governments do not receive the same type of safety and health job protections as those employed in the private sector. Approximately 8 million public workers in this country go uncovered by the Occupational Safety and Health Act. "I think it's appalling," Jessica Bohan said during a 2006 Chemical Safety Board hearing on a municipal water treatment plant explosion in Florida. Bohan, a consultant at the University of South Florida SafetyFlorida Consultation Program in Tampa, stressed that the work public employees perform is not always glamorous and the workers typically are not paid very well. She said these employees are proud of their work, yet they go without resources and basic protections their counterparts have in the private industry in states such as Florida. "How, in the United States of America, can we treat our public-sector employees [this way], the ones that keep our communities functioning?" she asked. "We can turn the lights on. We can use the toilet. Things we take for granted. There are people out there every day working on these systems, and we are not protecting them." Sadly, sometimes this can lead to tragedy. The CSB hearing focused on a deadly explosion at the Bethune Point Wastewater Treatment Plant in Daytona Beach, FL. Municipal employees were removing a metal roof above a storage tank when sparks from a cutting torch ignited methane escaping from the tank's vent. A fireball erupted, and the flames flashed into the steel tank, causing an explosion. Two workers were killed in the blast; a third was severely burned. Their employer – the City of Daytona Beach – did not have to adhere to the safety standards that private industry must follow. A Chemical Safety Board report issued in March 2007 on the explosion makes it clear that doing so could have prevented an explosion. "Had the city implemented hot work and [hazard communication] programs conforming to OSHA safety standards, the hazards of using a torch in proximity to the methane tank would likely have been identified and possibly prevented," the report stated. CSB recommended Florida require all state agencies, counties and cities to adhere to OSHA standards. Following a 2009 task force review that agreed with CSB's recommendation, board member and then-chair John Bresland in a blog post called the Bethune Point incident a "cautionary tale" to other states that do not currently have requirements to follow OSHA regulations. "Our public employees are simply too vital an asset to risk their being killed, injured or disabled in preventable workplace accidents," Bresland said. Florida used to require by law that state and local employers follow OSHA regulations. Even though it was not a State Plan state, wherein states establish and run their own OSHA program overseen by the federal agency, Florida spent millions of dollars each year on a consulting program staffed with 146 employees. An additional 125 staff members addressed occupational safety and health compliance issues in the public sector. However, in 1999, the legislature and governor repealed the 17-year-old state law. An executive order following the repeal directed state agencies to "voluntarily comply" with general industry OSHA standards, and recommended city and county agencies conduct a review and implement any necessary procedures. "It is my belief that only mandatory regulatory requirements, whether coming from a state or federal level, are needed to support and nurture safety efforts within the public sector," Brian Berke said at the CSB hearing. Then president-elect of the Florida section of the American Industrial Hygiene Association, Berke said safety typically is viewed by the public as inconvenient, expensive, impractical and ineffective. Also, the nature of the public sector being subject to a political environment results in cost-cutting pressures, he said. Funding is certainly a major challenge in ensuring the safety of public workers, said Jim Dougherty. Dougherty has worked in public transit for nearly 30 years and was hired last year as the chief safety officer for the Washington Metropolitan Area Transit Authority in the nation's capital. Additionally, Dougherty has been a part-time police officer for more than two decades. "Public employers, they stretch the life cycle of their equipment, whatever that equipment may be," he said, which can lead to breakdowns in equipment or defects in a vehicle. Dougherty said most employees want to do their job even if they do not have the right equipment or properly running equipment. "Unfortunately, they're going to try to do the job any way they can, be it safe or unsafe," he said. In addition to exposing the employee to hazards that could lead to potential injury or illness, these breakdowns can affect the quality of work. In an emergency situation, such as a police or ambulance call, equipment breakdown can have far-reaching consequences. When a public employee’s equipment fails or the worker is involved in a collision on the way to the scene, Dougherty said, the job cannot be performed properly. One component of the funding problem for safety in the public sector is the lack of an incentive, said Diane Matthew Brown, a health and safety specialist for the American Federation of State, County and Municipal Employees, a Washington-based union. "There's really no incentive and no desire to properly budget for not just safety equipment, but basic maintenance," she said. "When you say the word 'safety' to a supervisor or risk manager, that equates to [personal protective equipment], which equals a budget item." Funding is not the only challenge the public sector faces. Public work is a broad sector that includes wastewater treatment, highway work, libraries, nursing facilities, police and fire departments, and social work – all of which carry their own hazards, and some that may not necessarily have a counterpart in the private industry. In addition to the diversity of job types in the public sector, some municipalities have part-time employees and volunteers, said Abe Tarawneh, superintendent of the Division of Safety and Hygiene at the Ohio Bureau of Workers’ Compensation. “This becomes a challenge in safety education,” he said. Many volunteers may have full-time jobs and would prefer to complete the government job when they have time, rather than invest in safety training, Tarawneh said. Turnover also can be problematic in the public sector, as the nature of a democratic society with elections practically demands it, according to Michael Rea, industrial safety administrator for Ohio BWC’s Public Employment Risk Reduction Program. Changes in elected officials can mean a change in rules or regulations. For example, a law passed in Ohio in 2005 required local health departments to perform safety and health inspections at schools. Four years later, that law was repealed due to cost concerns with complying with the requirements. “There’s not always continuity in legislative requirements on safety-related issues,” Rea said. Despite the unique challenges that come with protecting public workers, steps can be taken to ensure employees are protected. 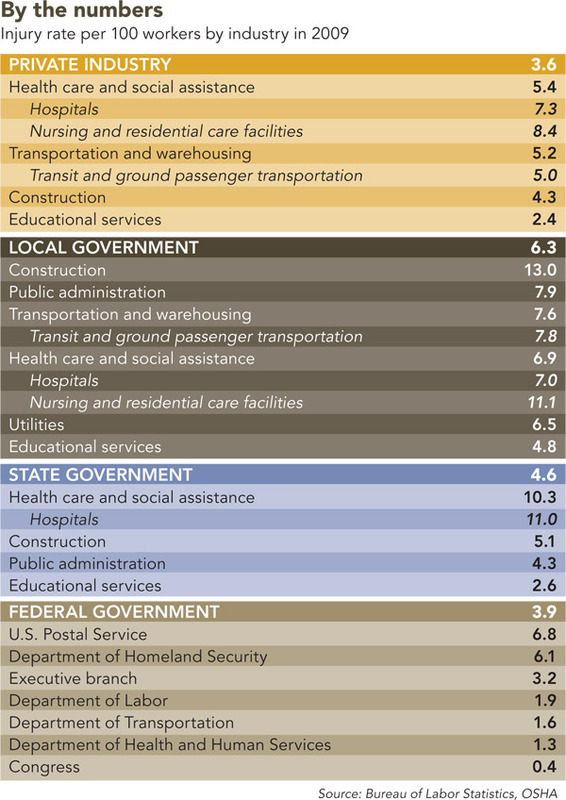 Half of U.S. states operate their own occupational safety and health program and, in choosing to become an OSHA State Plan state, are required to cover public workers. States also have the option of operating public employee-only programs and leaving enforcement of regulations in the private industry to the federal government. Four states have chosen this route, including Illinois. Illinois became a State Plan state in September 2009. The decision to do so was made in light of budget constraints within the state’s Safety Inspection and Education Division, the program tasked with public workplace safety inspections and compliance assistance, said Illinois State Plan Coordinator Cheryl J. Neff. As a State Plan state, Illinois is eligible to receive matching federal funds for the program to help cover its 1 million public workers. "The public-sector employees deserve the same rights and protection with regards to workplace safety and health as the private-sector employees in Illinois," Neff said. "We are here to ensure that happens." However, becoming a State Plan state is not necessarily the best option for every state, according to Neff, as each program is different and each state is unique. For instance, Ohio requires adherence to OSHA standards through its Public Employment Risk Reduction Program, even though the state is not part of the State Plan program. Rea called Ohio's BWC "one-stop shopping" where employers can come to resolve a number of safety-related issues in a single agency. Having both safety and compensation in one house allows the state to work more effectively, according to Tarawneh. "We know about every claim that happens in a public employer's workplace," he said. "Accordingly, we can know the trends. We can target certain things and certain employers and populations." Enforcement is not the only option – and may not be the best one – to ensure the safety of public workers. Rea noted that in addition to enforcement activities, PERRP runs field consulting programs with consultants in a number of areas, including construction, industrial hygiene and ergonomics. In tough economic times, when safety potentially could be scaled back, Matthew Brown stressed that projects still can be done safely if planned properly. "Regardless of funding, regardless of regulations, if there is no communication between the workers and the management and a really planned approach to how things are done, safety suffers," she said. Such communication can extend beyond public employers. Tarawneh said smaller municipalities and counties that may lack funding could join together to learn from one another. Safety for the public employee is a venture that should be established between the worker and employer. Knoxville-based Tennessee Valley Authority, a federal government-owned electric utility cooperation, established a program to align its leadership team with the concept of an incident-free, injury-free workplace, said Bill Campbell, TVA senior vice president of operating support and fleet governance. Coupled with behavior-based safety and peer-based programs, TVA has seen its reported incidents drop 61 percent in the past three years. According to OSHA, the cooperative had a 1.99 injury and illness case rate per 100 workers in 2009, lower than both the public and private employer average. "We have the same types of budget pressures everyone has to deal with, and I think it really has more to do with the value structure of the organization," Campbell said, adding that safety needs to be a collective effort – supported and reinforced by leadership and owned by employees. "The real secret to this is line management in each business unit actually owns this. They accept accountability," he said. Matthew Brown also has seen success using a peer-based program. Employees are trained on safety, and those workers then train their peers. Although this method requires a lot of cooperation, it does not necessarily cost a lot of money, and the results can be positive. "It is a very effective way to spread the safety message and get workers to own and buy into it," she said. In a situation in which public employees may not have the support of upper management, Matthew Brown said the best strategy is for employees to suggest the public could be at risk if something is not done. She said the safety of public workers has a direct effect on the safety of the public. For instance, unsafe working conditions at a health care facility will likely affect patient care, she said. Tarawneh asserted that an employer's views on safety in the workplace are a good indicator of the employer's views on public safety in general. Rea agreed, noting, "It's hard to call for one without paying attention to the other."